When is Your Vehicle a Total Loss? If a business-owned vehicle has been damaged in an auto accident, the firm's commercial auto insurer may declare it a total loss. Many business owners are irked when their insurer decides to "total" their vehicle. Here's a typical scenario. It Was Only Minor Damage! Christopher Clark has just finished a phone conversation with an insurance adjuster and he isn't happy. Christopher owns Classic Construction, a residential construction company. A truck Classic owns was stolen from a job site last week. It was recovered by police a few days later. The truck is insured under the standard business auto policy for auto liability, comprehensive and collision. The vehicle sustained some front-end damage, which looks minor to Christopher, but the insurer has declared the truck a total loss. Christopher finds this frustrating as he believes the truck could be repaired. He is also unhappy with the insurer's calculation of the vehicle's actual cash value. The truck is only two years old and his insurer says it is worth only half of what he paid for it! If the insurer declares the vehicle a total loss, it will calculate the vehicle's actual cash value (ACV). The insurer's calculation will include an adjustment for depreciation and the physical condition of the auto. When deciding whether to total a vehicle, an insurer generally uses one of two methods: the total loss threshold or the total loss formula. State law may dictate which of these insurers use. The total loss threshold is calculated by dividing the vehicle's repair cost by its actual cash value. It is expressed as a percentage. For example, suppose a vehicle will cost $8,000 to repair and its ACV is $10,000. The total loss threshold for the vehicle is 80 percent (8,000 / 10,000). When the threshold reaches a certain percentage, the insurer will "total" the car. Slightly over half the states require insurers to use a certain total loss threshold. The statutory percentage is generally somewhere between 60% and 100%, with 75% being the most common. In states where the threshold is determined by law, an insurer cannot declare a vehicle a total loss unless the state-determined threshold has been reached. Other states allow each insurer to establish its own total loss threshold. The remaining states permit insurers to decide whether to total a vehicle using a total loss formula. The insurer adds the cost of repairing the auto to the vehicle's salvage value. 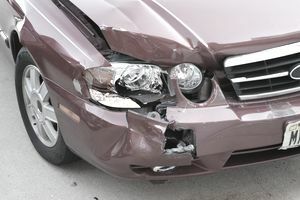 If the sum exceeds the vehicle's ACV, the insurer declares the vehicle a total loss. For example, suppose the salvage value of a vehicle is $2,000 and the cost to repair it is $5,000. If the vehicle's ACV is $8,000, the insurer will pay for the repairs (($2,000 + $5,000 = $7,000, which is less than the $8,000 ACV). Because older vehicles are lower in value, they are more likely to be totaled than new ones. Yet, newer cars are also vulnerable. This is because modern vehicles contain technologies like backup cameras, adaptive cruise control, and collision avoidance systems that are costly to repair. Many of these systems are computerized, and if a component is damaged in an accident, the damage can be difficult to identify and repair. Because of advances in technology, new generations of vehicles are often costlier to repair than previous versions. Another factor that affects repair costs is vehicle construction materials. Modern cars are made of lightweight materials that increase fuel efficiency and protect passengers by crumpling in a crash. Yet, these materials can be difficult, if not impossible, to repair. Dents in a crumpled panel cannot be hammered out like those in older cars. Instead, the entire panel must be replaced. Costs add up quickly so many cars are "totaled" rather than repaired. Modern technology has also driven up the cost of operating an auto repair shop. To fix cars nowadays, shops need sophisticated equipment that is expensive to purchase and costly to maintain. Mechanics require extensive training to perform basic tasks. The cost of equipment and training is passed on to customers. Once an insurer has declared a vehicle a total loss, it sends a form to the state vehicle licensing authority notifying it that the vehicle has been totaled. A totaled vehicle cannot be driven in its current condition. A vehicle that has been declared a total loss typically has some salvage value. The insurer usually retains the damaged auto as salvage and pays the vehicle owner the vehicle's ACV. The insurer must obtain a salvage certificate from the state. The certificate serves as evidence of legal ownership and replaces any previous titles to the vehicle. Once it has the certificate the insurer can sell the vehicle to an auto salvage company. In some states, you can retain a "totaled" vehicle by paying the insurer the salvage value. A salvage auto cannot be driven unless it is repaired and re-registered as a revived salvage vehicle. In order for the vehicle to be re-registered, it must pass a thorough inspection by your state inspection authority. If you don't intend to drive the auto but want to retain it for parts, you can obtain a nonrepairable vehicle certificate.